Building on a 25 year tradition of delivering the very best in DJ mixers, Rane is proud to introduce the MP25 Club Mixer. 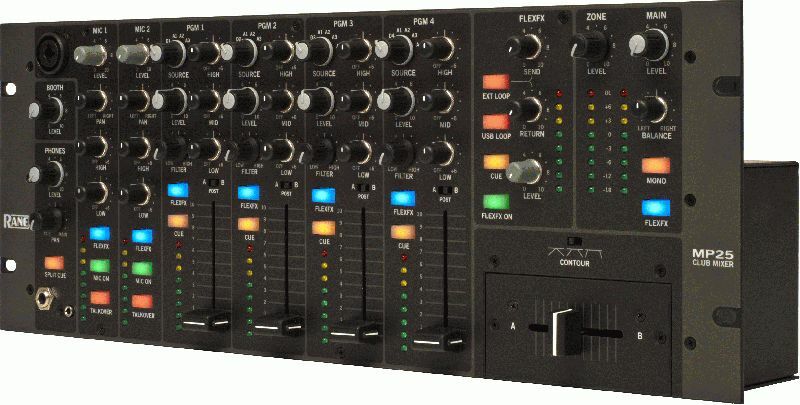 The MP25 satisfies the audio and ergonomic demands of performing DJs, in a 19” rack format preferred by nightclubs, with a compact 4U design that drops easily into a mobile rig. Sporting two microphone inputs, four studio-grade phono preamps, four analog aux inputs, four low-latency stereo USB inputs, analog and USB effects insert loops, and a variety of analog and digital outputs; the MP25 remains rooted in analog tradition while reaching new heights of digital connectivity. The MP25 ships March 2011.